Lifestream Barley Grass from New Zealand is nature’s premium alkalising food, imparting an alkaline residue that once digested that can help to nourish and balance your internal ecosystem. Due to its alkaline nature, Lifestream Barley Grass is neutralising, balancing and nourishing for the body, making this your perfect choice for natural nutrition to help balance your system. Lifestream young barley plants are harvested at peak potency and `flash air dried` in minutes to ensure the living enzymes and nutrients are not damaged or compromised. This is shown by the rich Chlorophyll content, which is a good indicator for correct growing practice, high quality plants and gentle processing. Lifestream also mill their plants to an ultra fine particle size to ensure easy mixing and absorption. 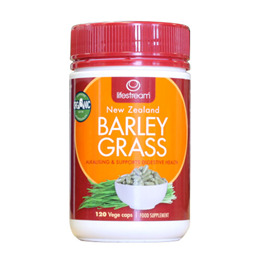 Lifestream Barley Grass is New Zealand grown and organic. Lifestream Barley Grass is free of pesticides, chemicals, preservatives, additives and fillers. Certified organic NZ Barley Grass powder (500mg), non-organic capsule shell (hypermellose, water). Adults: 4 capsules (2g) daily. Children 6-12 years: 2 capsules (1g) daily. Mix into water, juice or add to cold food. Food supplements should not be used as a a substitute for a healthy and balanced diet. Keep dry and tightly sealed. Below are reviews of Lifestream Barley Grass - Organic - 120 Vegicaps by bodykind customers. If you have tried this product we'd love to hear what you think so please leave a review. I was recommended this product by a lady who said it helped her with general aches and pains following a bout of sciatica. I started taking the capsules, four a day, at the end of April. Normally I suffer very badly from hay fever, but this year, since taking the Barley Grass, I have not had so much as a sniff or itchy eye! I can only accredit this fantastic development on my taking these capsules as I have done absolutely nothing else different this year to any other year, yet I am completely symptom free! It has made this a 100% better summer for me. Brilliant! I would whole heartily recommend this product to any sufferer. Give it a go. It might work for you too! 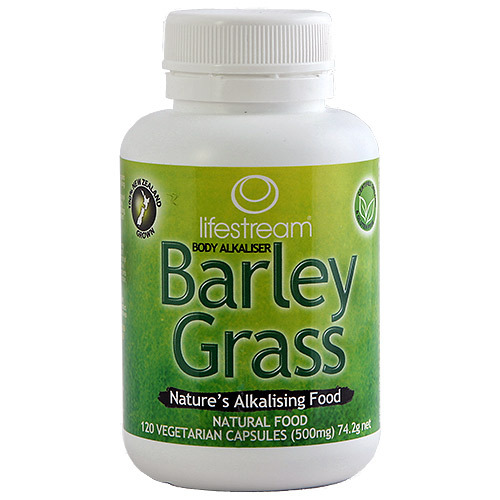 Question about Lifestream Barley Grass - Organic - 120 Vegicaps What type of person would benefit from barley grass? Barley Grass is a nutritionally rich product containing vitamins, minerals and amino acids and most people would benefit from it's inclusion in their diet. It is especially good to counteract acidity as it is a very alkaline product and it also offers high levels of chlorophyll which is a very effective blood and organ cleanser.